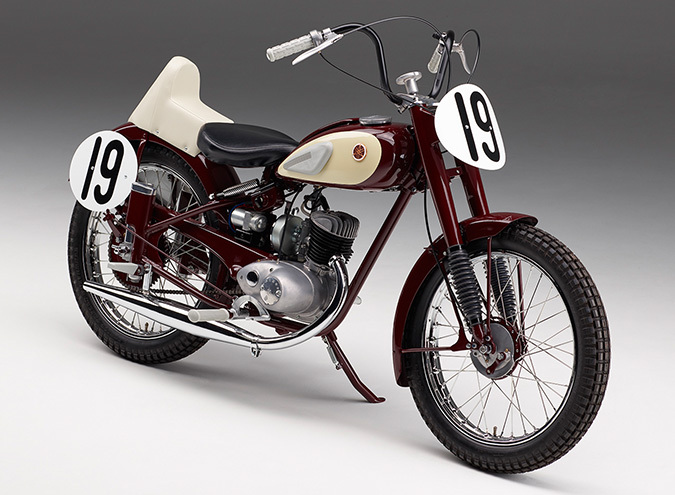 1955 YA-1 1st Asama Highlands Race spec - Communication Plaza | Yamaha Motor Co., Ltd.
Yamaha Motor’s first production motorcycle, the YA-1, was also modified for higher performance in racing. Following the company’s founding and entry in the 3rd Mt. Fuji Ascent Race in July 1955, Yamaha also registered for the 1st Asama Highlands Race to be held in November four months later. In preparation, a host of new modifications were made and the YA-1 dominated the top spots in the race, spreading the Yamaha name throughout the Japanese motorcycle industry. The machine on display is a replica of the bike that won the Asama Highlands Race ridden by Noboru Hiyoshi.